Somewhere, deep in the bosom of your Samsung Galaxy tablet, lies a storage device. It’s like the hard drive in your computer. The thing can’t be removed, but that’s not the point. The point is that the storage is used for your apps, music, videos, pictures, and a host of other information. The Galaxy Note and Galaxy Tab come with either 16GB or 32GB of internal storage. Future tablets may have even more storage. Removable storage is also available in the form of a microSD card. A GB is a gigabyte, or one billion bytes (characters) of storage. A typical 2-hour movie occupies about 4GB of storage, but most things you store on the tablet — music and pictures, for example — take up only a sliver of storage. Those items do, however, occupy more storage space the more you use the tablet. On the Home screen, touch the Apps icon. If necessary, choose the General category from atop the screen. Otherwise, you’ll find the Storage item listed on the left side of the screen. 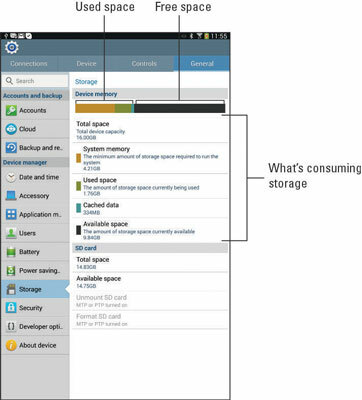 The right side of the screen details information about storage space in the tablet’s internal storage, shown as Device Memory. You can choose a category to see more information or to launch a program. For example, touching Used Space displays a list of items occupying that chunk of memory. You can choose a subcategory, such as Applications, Pictures, or Videos, to view more details. When a microSD card is installed, information about its storage appears in the SD Card area. Alas, further detail is unavailable. You’ll have to use a file manager app to review the storage device’s contents. To see how much storage space is left, refer to the Available Space item. Don’t bemoan that the Total Space value is far less than the tablet’s or media card’s capacity. For example, in the example, the 16GB media card shows only 14.83GB available. The missing space is considered overhead, as are several gigabytes taken by the government for tax purposes. You probably didn’t get a Galaxy Note or Galaxy Tab because you enjoy managing files on a computer and wanted another gizmo to hone your skills. Even so, you can practice the same type of file manipulation on the tablet as you would on a computer. Is there a need to do so? Of course not! But if you want to get dirty with files, you can. 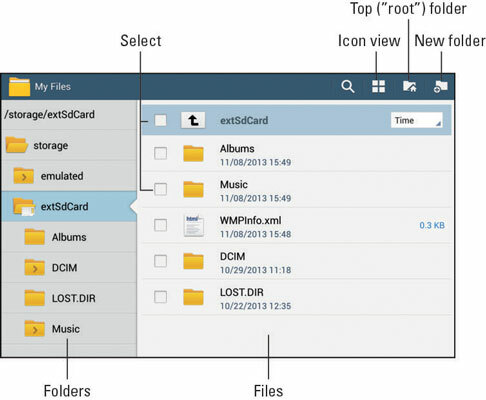 The main tool for managing files is the my Files app. It’s a traditional type of file management app, which means if you detest managing files on your computer, you’ll experience the same pain and frustration on your Galaxy tablet. Other icons appear atop the my Files app screen, depending on what you’re doing in the app. For example, to remove a folder or file, touch its check box and then choose the Delete (trash can) icon. If your tablet doesn’t come with the my Files app, you can obtain one of many similar file management apps at the Play Store.